The death of Martin McGuinness has inevitably prompted reflection on his career, with the reactions varying according to one’s political ideology. For the mainstream, McGuinness’s oeuvre is sharply divided into two halves, that of paramilitary godfather and political statesman, with the dichotomy arising from their view on the Provisional IRA’s (PIRA) long running campaign. For Sinn Féin and a wider body of sympathisers, that division is an artificial construct; the two eras – military leader and peacemaker — are different forms of the same struggle. The change in strategy by no means entails an admission that the Provisionals’ military campaign was misconceived, only that it could no longer sustain progress towards their goal. In fact, it is striking that such a claim has to be defended at all. The persistent demand for British withdrawal, accompanied by a willingness to kill in support of it, was the dominant feature of the PIRA for the first 28 eight years of its existence. 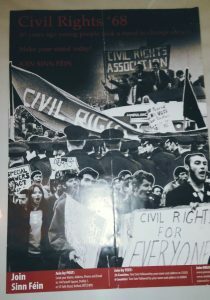 That the rights thesis is being promulgated illustrates primarily the cultural influence that Sinn Féin can today wield and thereby shape the narrative circulating, if not in the mainstream media, than at least amongst wider left-leaning circles. The Official leadership, primarily Cathal Goulding, Tomás Mac Giolla, and Seán Garland, with important backing from Billy McMillen, pushed for a civil rights campaign in the North as a way of cracking the Stormont regime, without provoking an intensely violent — and violently sectarian — conflict, which would in turn create the opening for building a class opposition — as opposed to an ethnic or sectarian one — to British imperialism. This was to be coupled with social agitation in the South as a way of building up a working class base in opposition to the compliant regime in Leinster House. Moreover, the Officials expanded their understanding of imperialism beyond the simplicity of London’s territorial control of the six counties to the impact that American capital, via the increasing levels of foreign investment, was beginning to have as well as the implications of EEC membership for Irish sovereignty. The OIRA, then, prioritised the political and social struggle and therefore the leading role of a revolutionary working class party as the agent of that change. In the context of the early 1970s, this was a difficult strategy to pull off. The conflict entrenched sectarian divisions and stymied the Officials’ strategy in the North. Naturally, neither the British State nor the unionist paramilitaries as defenders of the status quo could be expected to play a progressive role. The various strands of the republicanism, however, had the potential to play such a role, making the strategic choices they faced all the more important. The choice to engage in war had consequences, not only for hundreds of deaths and a deepening of the divisions, but of narrowing the space for political struggle. The argument from Gerry Adams that only later was it possible to engage in peaceful struggle for democratic rights misses the vital fact that the Official leadership had not only pushed for that in the crucial early years but had also argued, correctly, that a military campaign could not possibly achieve its political objectives; that to defeat imperialism required mass support; that socialism was the necessary modern incarnation of republicanism; that the working class was therefore the key social group to organise. Historical context is necessary when appraising the choices of figures like Martin McGuinness. Demonisation as a simple terrorist does not persuade those who understand the context in which he made the choices. But criticism is necessary, particularly if we wish to avoid the romanticisation of a military campaign at the expense of political strategy. There were other options; there were even other revolutionary options. The Provisionals chose instead the traditional nationalist one, and settled into the role as Catholic Defenders with a republican gloss. As such, their present incarnation as modern day Daniel O’Connells is none too surprising.